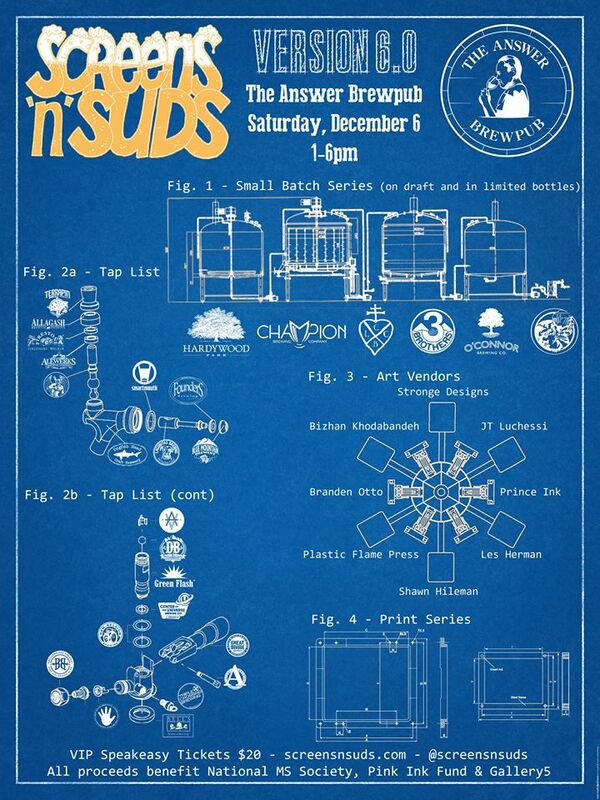 Screens ‘n’ Suds brings back their big beer and art event for its sixth year Saturday December 6th at The Answer Brewpub starting at 1pm. You should definitely check this out as proceeds go to benefit National MS Society, Pink Ink Fund, and Gallery 5. There will be awesome screen printed art for sale, live music, and delicious craft beer including the return of SnS’ small batch series. New this year is the addition of a VIP Speakeasy featuring tastes from rare bottles donated by members of the local beer community. The speakeasy is already sold out but you can win tickets along with some other goodies. Deadline for entering the raffle is Friday December 5th at noon. Head over to the Facebook event for more details including the complete tap list for the day.